So, a unicorn farted golden rainbows into a bottle, and the resulting, um, product is for sale. And it's guaranteed to give you "the best-smelling poop of your life" or your money back. This is not a scatological acid trip, but it might be the closest you'll get. Squatty Potty, dubbed "the stool for better stools," has launched its first brand extension, a toilet spray, by bringing back its adorably fluffy animatronic puppet from last year's viral video, "This unicorn changed the way I poop." 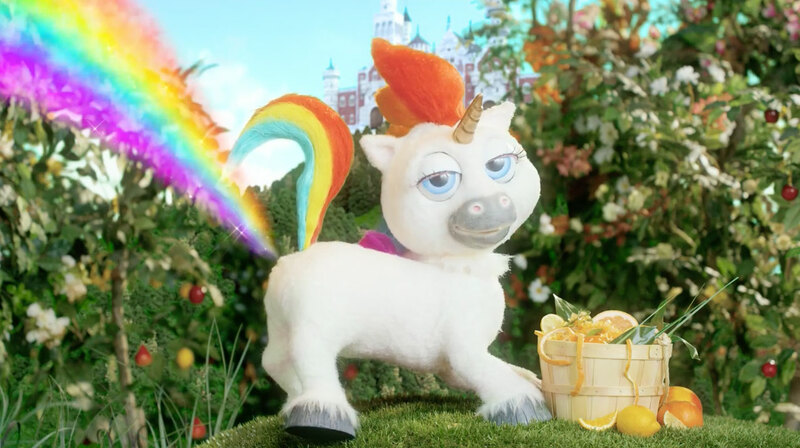 The new four-minute ad, from viral mavens the Harmon Brothers, uses the same handsome princely narrator and doe-eyed mythical creature to introduce Unicorn Gold, an essential oil- and gold-flecked competitor to Poo-Pourri and other bathroom odor eaters. The prince and unicorn have become so popular—the earlier ad has racked up more than 120 million views since last fall—that the Harmons felt confident bringing them back. "We've seen that with Hollywood movies, you can't often find a sequel that's as good or better than the original, and for ad campaigns, that's even more true," Benton Crane, managing director at the Provo, Utah-based Harmon Brothers, tells AdFreak. "We knew it was a pretty tall order to do a sequel, but we were willing to take on the challenge. History will be the judge." The agency also created Poo-Pourri's viral video "Girls Don't Poop," but hasn't worked with that brand for several years. Squatty Potty quietly debuted the new category challenger, Unicorn Gold, earlier this year, naming the product after the earlier hit campaign that boosted online sales of the Squatty Potty stool by 600 percent last holiday season. The video, which should be called "Squatty Potty 2: Fruity Booty," combines what the Harmons do best—product demos mixed with cheeky humor interwoven with a direct-sell message. There's also an outhouse explosion, a fart-capturing suction device and a reference to "paying your taxes to Prince John." Aiming to set Unicorn Gold apart from Poo-Pourri and its ilk, the fantastical period-set video gives a play-by-play of how the product works. There's a poop emoji as a visual aid. And elaborately dressed royal ladies who "release the Kraken." Unicorn Gold "protects the drop zone," says the video, and not just the surface of the toilet water, so the stank never leaves the bowl. It comes in scents like Pinch of Vanilla, Citrus Squeeze and Tropical Dropsicle. The charmingly affected narrator makes sure viewers know "this is not a joke," and that you'll no longer have to smell the "icebergs, mudslides, stalactites and anacondas" (again, visual aids!) in your bathroom because the gold particles in the product "cling like magnets to poop fumes." The campaign launches Thursday on Facebook, where agency and brand execs hope it will take off organically with likes, views and shares. They're including a media buy on YouTube in the initial rollout. Squatty Potty, which started as a home-based business in Utah before landing its Shark Tank investor, pulled in more than $15 million in sales for its core product last year, which also retails at chains like Bed, Bath & Beyond and Target. Unicorn Gold is expected to have similar distribution.